As the whole of the American political class is divided on the Mexico border wall funding issue, about three hundred ardent supporters of Trump gathered Friday evening in Sahuarita to listen about the plans to build a private wall along with the Mexican border. Organizers of the We Build the Wall campaign lacked specifics about their plan, but as per them, they could build the border wall cheaper, faster and better than the federal government by using crowdfunding to pay for walls on ranches and private land, including in Arizona. “We put together the original gangsters, the O.G.s of the MAGA movement” to help the campaign for funding the wall, said former Trump adviser Steve Bannon. Bannon told the crowd of mostly retirees at the Quail Creek Country Club that they had met with the ranchers of Southern Arizona and also are in consultation with “high level” elected leaders in Arizona. 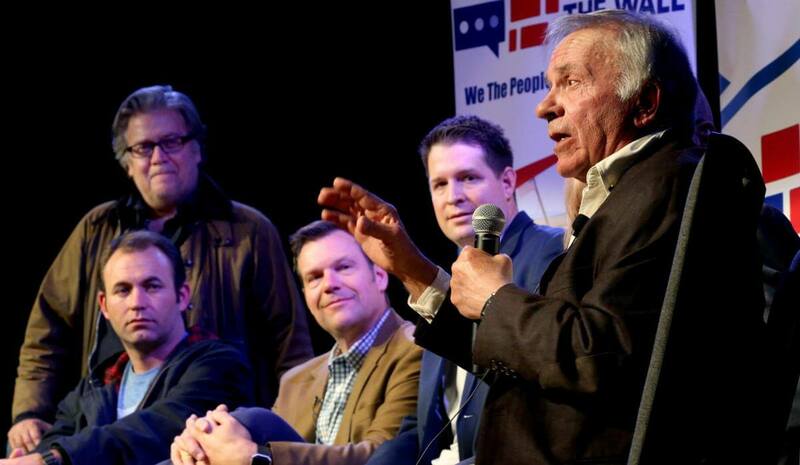 Bannon was joined in the event by another former presidential adviser, Kris Kobach, and former Congressman Tom Tancredo, an immigration hard-liner from Colorado. Also, there was the leader of the crowdfunding page, Brian Kolfage, an Air Force veteran who lost three limbs while serving in Iraq after attending the University of Arizona, and got famous after news broke in last month about his plans about building the wall. The campaign started from an online effort in December with an aim to raise at least $1 billion. However, the campaign stopped before it could reach $20.6 million from about 350,000 people. The effort now has turned into a formal foundation. Bannon said, “They were all interested in doing something on their land.” He said none of the ranchers wanted to publish their names at this moment. Poedtke attended the event with Carole Keane, 72. Both live in Quail Creek who agrees with building a wall but wanted to know more about specifics of the project. Keane questioned how the project plans to deal with the local governments along with the border as some of them have their own building regulations. Poedtke wanted to know what would happen to the fund of the plan to build the wall does not materialize. “With a $200 million pot, a lot of attorneys are going to say, ‘Oh, man, I want to be a part of this,’” Poedtke said. However, the panel of speakers mostly avoided the topic what would happen to the fund if the plan falls through. Bannon referred to Kolfage’s initial campaign, saying most of the donors said they would opt in to build the wall with private money after a technicality derailed the original plan to give the donations to the U.S. Treasury. Kobach promised the crowd that the group could not only build the wall before the Government but also it can complete the whole task with less amount of money than the Government. He also said not every future effort of the group will be publicized, as some actions could attract unwarranted attention from outside groups that would file lawsuits in attempts to delay construction on private land. Kolfage said that he was optimistic that the border wall on the private land would start soon. Though this is not the first time that an effort of this kind is being made for the infamous border wall, this effort having big names seems promising. But, the crucial thing to watch here would be whether it is feasible owing to the federal laws and laws of respective bordering states.